I finally can say that I published my dissertation. Although my defense was already in December, it took some time to wrap everything up and get the book published. But what did I actually write about? Using both a theoretical argumentation and an empirical investigation, I rationalize the view that in order to understand people’s privacy perceptions and behaviors, we need to adopt a situational perspective. To this end, the book is divided into three parts. Part I advances the theory of situational privacy and self-disclosure by discussing impacts of new information and communication technologies on traditional theories of privacy and self-disclosure. Based on five basic suppositions, it describes three major processes of the theory: pre-situational privacy regulations processes, situational privacy perception and self-disclosure processes, and post-situational evaluation processes. Next, Part II presents the application of the theory to smartphone-based communication. It first analyses how people choose certain communication environments on their smartphones, how they manipulate them, and how these external factors affect self-disclosure within these environments. It then details a multi-method study conducted to test the derived assumptions and discusses the obtained results. Part III reflects on the overall implications of the theory, summarizes the major findings and lastly considers possible extensions and perspectives on future research. 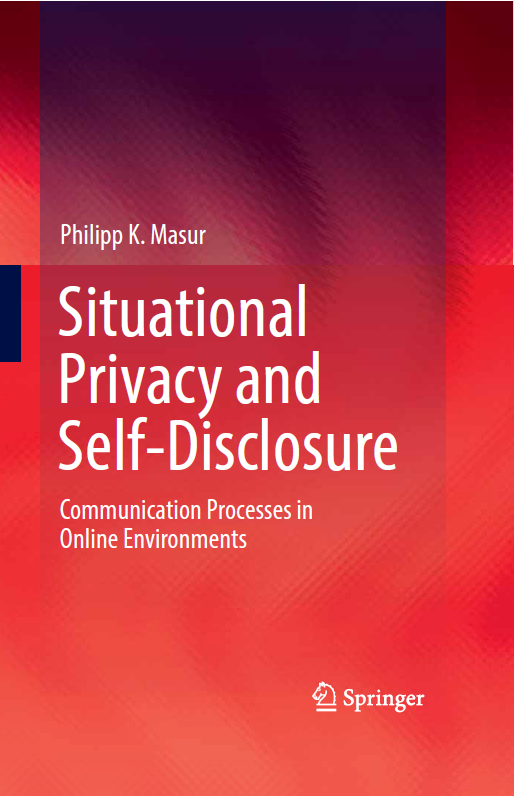 The book is mainly intended mainly for researchers in privacy and communication studies as it offers privacy scholars a systematic review of both classic and contemporary theories of privacy and self-disclosure as well as a new theory for studying privacy and self-disclosure from a situational perspective. At the same time, communication scholars may benefit from an additional methodological discussion of the mobile experience sampling method, which – in my opinion – provides an invaluable approach to measuring situational communication processes. You can read more about the book here. You can buy the hardcover or the ebook here.